1. FRIEDRICH CHRISTOPH8 MULLER (JOHANN CHRISTOPH7, JOHANN GEORG6, JOHANN JOSEF5, JOHANN HANS ZACHARIAS4, HANS ADAM3, WOLF2, HANS1) was born October 01, 1805 in Ziegelroda, and died August 05, 1874 in Hanover, Illinois. He married CHRISTIANE BEYER 1831. 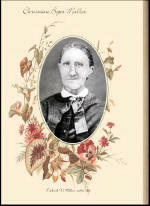 She was born October 13, 1810 in Bachra, and died January 28, 1882 in Hanover, Illinois. Came from Germany in 1849 and lived in Milwaukee for five years before settling on the farm near Hanover. They came from a small town in the Prussian Province of Saxony (formerly East Germany). 1880 Christina still on farm managed by son William G.
3. ii. CHRISTINA MILLER, b. 1833; d. April 21, 1887. 4. iii. WILLIAM G. MILLER, b. April 16, 1837, Prussia; d. November 03, 1883. 5. iv. THERESA MILLER, b. 1845. CHRISTOPH7, JOHANN GEORG6, JOHANN JOSEF5, JOHANN HANS ZACHARIAS4, HANS ADAM3, WOLF2, HANS1) was born Abt. 1836 in Prussia, and died December 02, 1863 in Nashville, Tn. He married JANE HATFIELD March 17, 1859, daughter of EDWARD HATFIELD and MARY JACKSON. She was born April 17, 1835 in Henry Co., Indiana, and died February 11, 1875. Chickamauga and dies from erysipelas. in 1872 buys the Gleason farm in section 21 Washington Township. d. January 21, 1934, Savanna, Il. 7. ii. 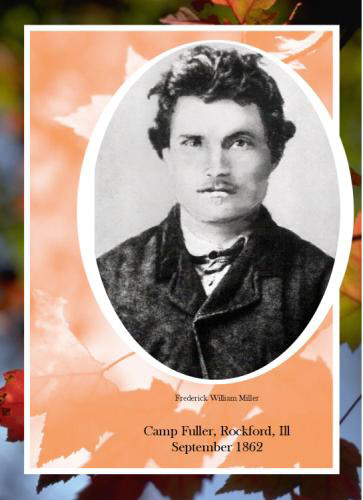 JOHN W. MILLER, b. August 02, 1862, Savanna, Il. 26, 1826 in Province of Saxony, Prussian. Chicago and was a baker. Spring of 1852 he heads for Milwaukee and married. i. GUSTAV10 FRANCKE, b. 1851, Milwaukee. ii. HERMAN A. FRANCKE, b. 1855, Hanover, Illinois. iii. JULIUS A. FRANCKE, b. 1858, Hanover, Illinois. iv. CHARLES F. FRANCKE, b. 1862.
v. ALBERT W. FRANCKE, b. 1863.
vi. WILLIAM H. FRANCKE, b. 1869.
born September 1847 in Prussia, and died 1934.
i. MARY10 MILLER, b. 1871.
ii. CLARA MILLER, b. 1873; d. 1955.
iv. EDITH MILLER, b. 1878.
v. ALBERT MILLER, b. 1880.
vi. LAURA MILLER, b. 1883. ROSANNA SCHOENHAAR. He was born October 31, 1833 in Wurtemburg. Mississippi River to Northern Illinois. MARGARET LAW. She was born August 05, 1868, and died January 17, 1944.
i. ELSIE BELLE11 MILLER, b. December 07, 1888; m. MR. WINSTON. 10. iii. FLORENCE MILLER, b. November 20, 1895. JANE CARRUTHERS. She was born May 10, 1865.
i. GLEN GILLESPIE11 MILLER, b. September 02, 1894. 11. ii. LAWRENCE FREDERICK MILLER, b. April 23, 1899; d. 1970, On his farm. 12. i. CLYDE A.11 MILLER, b. June 28, 1917, Hanover; d. March 30, 1971.
was born August 28, 1895 in Savanna, Il, and died July 1983 in Lanark. 13. i. EDWIN A12 MILLER. 14. ii. GERALD W MILLER. 15. iii. JO ANN MILLER. 16. iv. LUCILLE E MILLER, b. Abt. 1921. 17. v. DORIS MILLER, b. Abt. 1923. 18. vii. MERLE FRANCES MILLER, b. January 17, 1925, Washington Township, Il. married JESSE MC INTYRE. He was born 1891.
i. DANIEL12 MC INTYRE, b. 1927. 20. i. JANE12 MILLER, b. 1923.
ii. JOHN DAVID MILLER, b. 1926; d. 1960; m. REVA JEAN RAHN. died March 30, 1971. He married ELVA HILL June 12, 1937 in Peoria.